Last spring I read slowly through the book of Psalms. It was during the period when church matters weren't going well. People were upset. Some were leaving. It has been the most stressful season of ministry ever for me. You know, the Psalms are prayers. "Help" and "Thanks" are our two basic prayers and we pray these spontaneously. But honesty and thoroughness don't come as readily. Psalms are not the smooth, polished, poetic prayers we have made them out to be. Especially in the original language, it is obvious that they are raw--honest, passionate prayers to God. In my journaling through this book, I did something a bit different. After reading each psalm, I wrote a brief prayer to God. One side of me doesn't want to blog these journeys because the prayers are very personal to me. But one of the purposes of a blog is for the writer to be transparent and share the true matters of the heart. Don't get your hopes up for "juicy" stuff. For example, when David prays harm upon his enemies, I don't mention names :-). And as I wrote the prayers, I knew that they probably would be published in internet land. So I kept that in mind as I journaled. So, my prayers went much deeper than what you will read. At the same time, I hope that the personal nature of these prayers will at least give you a glimpse into the struggles of my soul. Last time I counted there were 150 psalms. I know it will take a bunch of blogs...but I plan to blog every prayer that I wrote during these weeks in this wonderful book of the Bible. They were handwritten. I wanted to type them out anyway. So as I type, I will pass them on to you as well. Psalm 1--Lord, give me the discipline to chew on Your Word day and night so that I can live a fruitful life. Psalm 2--Father, open the eyes of world leaders so that they will recognize that there is a God of this universe who is supreme and carries far more power than they. Psalm 3--Father, even though many forces are attacking, You give me rest each night. And I awake refreshed, knowing that You will fight my battles. Psalm 4--Lord, help me experience your joy in every ordinary day. Psalm 5--O God, it is incredible that you invite me to come into Your house as Your guest. 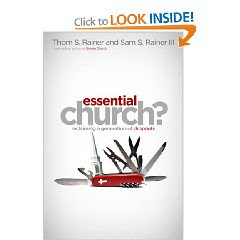 I introduced you last week to Essential Church by Thom and Sam Rainer. The driving force behind this book is that 70 percent of church-going young adults, ages 18-22, drop out of church. Instead of asking the question negatively, put a positive twist on it. Why do 30 percent of young adults stay in church? The answer? They see the church as essential in their lives. Realistically, churches are doing very little to become essential to the lives of their membership. In a nutshell, the essential church has four components. It has learned to simplify. It moves its members to grow deeper in biblical truth. It has high expectations of its members. It is committed to helping its members multiply spiritually. The church is losing ground. Between 1990 to 2004 the U.S. population grew by more than 18 percent. During the same time frame, church attendance decreased by around 3 percent. We are especially losing ground in reaching the emerging generation. Is it Phi-le-mon with long "i" and long "e" with the accent on the second syllable? Or is it Phil-e-mon with short "i" and short "e" with the accent on the first syllable? I've heard both and I'm not sure who could answer that question definitively. I prefer the long "i" and "e". Anyway, here are some takeaways from my read through the very short book of Philemon. For whatever reason, Paul wanted to make sure the readers knew that he wrote this letter with his own hands and not through a scribe. This letter acquaints us with Philemon (a slave owner) and one of his slaves Onesimus. Storyline: Onesimus, the slave, a Christian in name only, fled from his owner. He ends up under Paul's mentoring and becomes a true follower of Christ. Now Paul writes Philemon to ask him to be gracious as Onesimus returns. Onesimus hand-carried the letter to Philemon. Verse 2--Evidence that the early church met in homes. Verses 4-7--Philemon was a model believer. Verse 5--Our love for Jesus should always brim over to other believers. Verse 6--Moreover, our faith in God should brim over into good deeds. Verse 10--Spiritually speaking and referring to his relationship with Onesimus, Paul says, "I fathered a child." Do you have anyone you could declare that you fathered in the faith? When Onesimus left Philemon, he was a slave. He returned to his boss a changed man, a true follower of Christ. Even from prison Paul had a contingent of followers/helpers who partnered with him in advancing the gospel. Thom Rainer and his son Sam have written a landmark book on why so many teenagers and young adults are dropping out of church. Their book is called Essential Church: Reclaiming a Generation of Dropouts. This is one of those books every church member should read if we are interested in trying to reach the emerging the generation and keep young adults in church. I'll probably do several blogs from the book. I'm not finished reading it yet; but I'm telling you it is loaded with eye openers. Here is the disheartening fact that serves as the basis for the Rainers' book: 70 percent of churchgoing young adults drop out of church between the ages of 18 and 22. What are the main reasons they are dropping out. Here are the top ten. In a capsule, all these reasons funnel into one primary issue: they did not see the church as essential to their lives. Hence, the title--The Essential Church. Can the trend be stopped? The answer is yes. Some churches have been successful keeping young adults engaged. The key question that must be answered is: How can the church become essential to this emerging population? More to come later. Last Sunday we had our first deacons meeting for 2009. I'm excited about the group God has placed in this very important role. This group represents the largest body of deacons ever at Chapin Baptist. Eleven of the fifteen serving their first year are brand new deacons. We had an ordination service for them on the evening of January 4. Standing before these men and their wives last Sunday, I shared portions of the story of Esther with them. In light of the tough transitions our church went through last year, I asked them, "Could it be that God has placed them in this strategic position for 'such a time as this'?" I believe God has. This large group represents long-time members and newer members. It respresents senior adult members and twenty-something members. I have a personal sense of pride in that my son Kevin was ordained and is now serving on the deacon body. I was extremely proud as we all stood at the conclusion of the meeting and asked for anyone to voice a prayer who felt led to do so. Kevin, the youngest guy in the group, in the middle of these seasoned men of God, voiced a prayer that obviously came straight from his heart. Yes, I'm a proud dad. I sense in this group a sincere desire to grow deeper in their faith and to become genuine servant leaders for Chapin Baptist. They need your prayers. I need your prayers as I seek to lead them to reach their God-given potential. Who knows? Several years down the road, we may look back and agree that God used these men to accomplish significant things for the kingdom. Perhaps God has placed them in this place of service for such a time as this. I'm ashamed that it's been more than I month since I last blogged. It's the first of the year--the time for making New Year's resolutions, setting goals, or whatever terminology you want to call them. I am a believer in setting goals that go deeper than mere intentions. And one of my goals this year is to be more consistent with posting blogs. I enjoy writing. And I have found it to be a good way to communicate with the church family about what I'm doing, thinking, reading, planning, etc. If you find these posts helpful in the least, please tell others and get them to check it out. You can subscribe and receive emails when the latest blogs are posted. Or if you're like me and read other blogs as well, you can subscribe on your feeder. I use Bloglines. Anyway, I appreciate the positive feedback I've received from last week's sermon. It was one of the toughest I've ever preached. The spiritual battles were in full force. (And, yes, my pottie time doubled on Sunday morning). One of the things about state of the church messages is that they come around every January. And the message should always paint an accurate picture of the times. Do you think Obama's State of the Union address will deal with the economy? Hello. He's not going to stand up there and paint nothing but beautiful pictures. In the same way, last Sunday's message was an opportunity for me to share many of the positive things happening but at the same time share some of the things that did not go well in 2008. It was a time for me to publicly acknowledge my personal struggles and confess my areas of failure. And it was a time for me to call the church family to repentance and broken hearts. It's all about the heart. When we allow God to break our hearts over our own sinfulness...that's when true healing will take place. We're on the verge of some God-sized happenings. We are a family. Families sometimes struggle. The CBC family has struggled. But we have talked openly, we have prayed, we have wept. And as we continue to heal, we will put the past behind us, learn from it, and move on for the kingdom. Thank you for your love, grace, forgiveness, and patience with me.